Also known as vitamin B3, nicotinamide adenine dinucleotide (NAD) is an essential factor for many biological processes, including fat and glucose metabolism, the production of ATP (the cell's primary carrier or energy), and the functions of key proteins, including the sirtuins. NAD can be produced from multiple pathways1, including through metabolism of tryptophan (trp), nicotinic acid (Na), or nicotinamide (Nam). Nicotinic acid and nicotinamide are both also referred to as niacin or vitamin B3. NAD can be further metabolized into NAD and NADP which are used in a variety of biological pathways. The sirtuins are important sensors of metabolic state in the cell (meaning they can sense the metabolic state, and initiate downstream cellular events in response). Sirtuins modulate the activity of proteins by removing specific chemical groups (acyl, succinyl, malonyl, and palmitoyl groups). Key proteins in the mitochondria are regulated by acylation. Thus the sirtuins play a critical role in the function of mitochondria, the cell's powerhouse2. Many studies have demonstrated in yeast cells, worms, and mice, that modulation of sirtuin pathways and NAD, can increase lifespan and healthspan (healthy lifespan).3Multiple recent studies have linked aging with a decline in NAD levels, and that supplementation of NAD can increase lifespan in worms and mice through a mechanism that depends on sirtuins.2,4,5,6However, while there are many studies showing positive benefits of sirtuin modulation on lifespan, one 2011 study demonstrated that many of the lifespan increasing effects of sirtuin overexpression in yeast and flies, dissapears when proper genetic controls are used.7However, follow up studies in mice using sirtuin overexpression, or sirtuin-activating compounds (resveratrol, NAD+ precursors, etc), have demonstrated improved organ function, disease resistance, and increased longevity.3. The sirtuins can be modulated by a variety of different molecules. The most famous sirtuin activator is resveratrol, a compound naturally found in grapes (and wine), as well as peanuts, blueberries, and cranberries. Six studies have demonstrated that resveratrol is effective in humans, with most studies showing improvements in glucose metabolism and increased indicators of cardiovascular health.3Another strategy to modulate sirtuins is by increasing NAD, which acts as a co-factor for sirtuin proteins. Increasing NAD in the cell results in more co-factor for sirtuins molecules to use, thus allowing for greater sirtuin function. 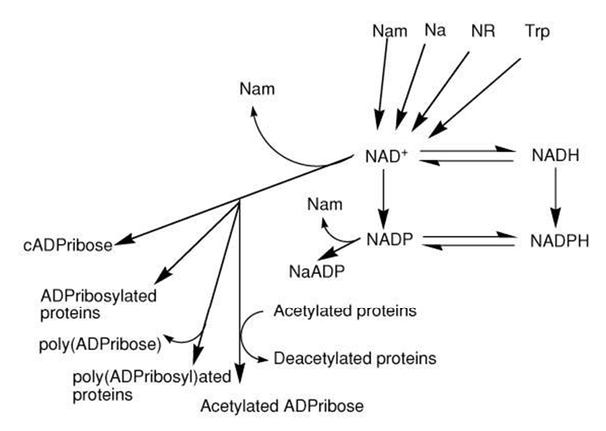 The most widely used method to increase NAD is by delivering pre-cursors: compounds that become metabolized into active NAD once they are ingested. Nicotinamide mononucleotide and nicotinamide riboside are the two most commonly used precursors. There is good evidence that modulating sirtuin pathways and NAD+ cofactors for these pathways can effect fundamental cellular processes that lead to improved cardiovascular and metabolic aging in lower organisms (yeast, flies, and mice). More studies of human aging biomarkers and non-human primates are required, however, before we can be confident of the interventions that can most readily improve sirtuin function, healthspan, and lifespan. Indeed, there are multiple strategies to modulate NAD, and NADH, and mitochondrial pathways. Including ketone esters, nicotinamide riboside, nicotinamide mononucleotide, and resveratrol. Rigorous studies of specific medical endpoints need to be carried out in order to determine what interventions are best.